Travel to Argentine is travel to the capital of tango and steak. 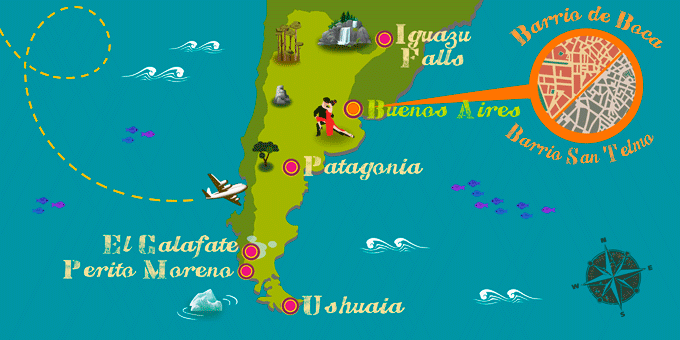 This Latin American country is characterized by music, dance, its gastronomy and the nature that surrounds it. Argentina is also known for the long distance from one end of the country to the other, spanning from the Iguazu Falls, which border Brazil, to Patagonia, where you will find natural wonders such as the Perito Moreno glacier. Its capital, Buenos Aires, is a city full of life where we find the colorful street of Caminito, the most typical street of the city in the La Boca district, and home of the famous Boca Juniors, considered one of the five soccer legends of the country. Travelers who go in vacation packages to Argentina can also explore its literary legends, amongst them authors such as Quino, where there is a life-sized statue of his famous character, Mafalda, seated in the neighborhood of San Telmo. Don’t overlook the chance to visit, the Cabildo museum, take a stroll down the Avenida de Mayo or take a seat in the Café Tortoni, historically frequented by intellectuals.